Thunderbird knows a lot about your email. After all, it’s got access to large amounts of data, and builds sophisticated databases so that it can be very responsive, even when dealing with large folders containing thousands of messages. Wouldn’t it be nice if we could use this information to extract either faster workflow, or even insight into our email habits? On Tuesday, as he was slogging through some somewhat antique code in the front-end of Thunderbird, Andrew asked whether Thunderbird’s “start page” was what we wanted it to be, which is Andrew-speak for “this is broken, we should fix it”. We’d actually discussed what to do with that page for a long time, but had focused on other, more infrastructure bits for a while. I decided it was time to dust off those plans, and see what we could do. First, some background. 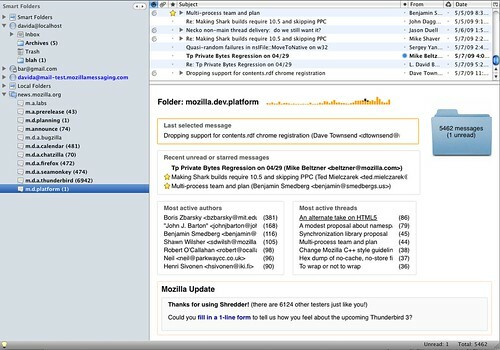 The “start page”, which makes a lot of sense in Firefox, never made a huge amount of sense to me in Thunderbird. In particular, it’s shown only when a folder is selected, and no message is selected. That’s hardly a logical time to show the (colorful, pretty, but fairly useless) page we show now. Instead, why not show information about the selected folder, and help people who clearly intended to select a folder, so most likely wanted to do something related to that folder! We could still use a small part of the pane to display interesting news snippets, as a way of keeping users aware of new developments, such as new add-ons that we want to promote, or Mozilla events. In fact, by making that page useful, we’re more likely to get people to read a sentence or two which might change periodically, as opposed to changing a page that is so big, wordy and useless, that I suspect most users are completely blind to it. and finally it gives some information about the activity in the folder: a histogram showing activity over the last 52 weeks, and most prolific authors and most active threads during that same period. The icing on the cake is that if you hover over an author or a thread title, it will highlight when those messages occurred in the histogram (in this case, the “An alternate take on HTML 5” thread). Readers of m.d.platform won’t be surprised at any of the names that show up above! Note: this hasn’t been through a visual design phase yet — the look will change, once someone who knows what they’re doing has a chance to make it nicer! There’s also a lot of work to do to make sure that it does the right thing for saved searches, smart folders, etc. And yes, we’ll make it optional, just like the start page is now. which isn’t as short as it should be, telling me pretty quickly that I have some old messages that need attention. It’ll be interesting to see what else we learn from these kinds of simple personal analytics. What other kinds of visualizations, summaries, and analysis would you like to see in Thunderbird, or in add-ons? I don’t think the tagpie is worth keeping, but the dots are tempting. As an aside, the Protovis library really is as easy to use as I’d hoped. I’d love to see that be somewhat modular, perhaps even with it’s own light weight extension API… similar to perhaps iGoogle widgets or WordPress Dashboard. Let users decide what they want to see, remix, reorder, etc. @robert: that sounds good. Want to write a patch? (Seriously, I’m expecting that in the short term addons can do the usual thing of tweaking the DOM at will. Building a widgety API would be great, but I don’t want to let the perfect become the enemy of the good). David, that’s great. Definitely the right direction! You could also display information on IMAP quota, if available. The email client has all relevant data about your social network. I still wonder why nobody ever created an app or addon which shows the relation between people in a diagram. So, when I send a mail to John and CC Jane, and John replied to all CCing Pete, I expect to see diagram with John being connected to Jane and Pete etc. Can’t wait for this patch! That looks awesome, hopefully when I install Fedora 11 I’ll get to try out some of this new work. 2. I’m assuming all data that are listed are clickable searches (in a new tab?). For example, if I see there are 10 important emails from person A & if I click on person A’s name Thunderbird will open a new tab, search for messages from person A within the folder & show me the messages from person A (I haven’t seen the tab feature in TB 3 yet, but please, please implement the way opera browser has implemented the tab feature – which I think is the best out there). 3. Since we are talking about folder summary, how about be able to add folder description when a new folder is created & which can be shown in the folder summary? @Laurens: file a bug, please? Just a quick note to say this is sounds like a great idea! If I’ve missed anything, please forgive me. Would the new start page or feature only be viewable when Thunderbird starts? Something this cool and helpful should be accessible at all times and for all folders, and if anyone agrees with that, then perhaps an extension would be a better idea unless it becomes a core feature. And speaking of which, I could really use an extension for folder management that includes your proposed features. I find this lacking in Thunderbird. I have 6 email accounts (adding another after this), and numerous sub-folders and I do not use a global inbox so scrolling, searching, and clicking through them is tedious, time consuming, and not much of a productive way to get things done. Having a page displaying all of my folders and that includes stats, analysis, etc and access to their sub-folders would be enormously helpful. I could dump the side bar and have this folder page open in a tab, or several tabs for different folders. I use Quick Folders which allows me to add bookmarks to folders on a toolbar which is awesome, but space is limited. In any event, I love your idea and would like to see this happen no matter how it is implemented. By the way, thanks for using a decent, well, the best CAPTCHA service. It really makes a difference. * Counts of messages filtered into subfolders and links to those subfolders. I still think showing the actions of filters would be useful for observing flow to neglected lists or buzzing topics. Soem keyword extracts from top flow areas might be cool too. This is a great new feature for Thunderbird 3 ! Just quite like the “awesome bar” in Firefox : it seemed to me pretty optional at first but it is totaly addictive indeed. When I first read this post I thought you were talking about the first page that shows up when Thunderbird starts which basically says “Welcome to Thunderbird blablabla …”. Is there any plan to get rid of this and instead offer the user the ability to choose what tab / folder or anything else appears on start-up ? An awesome feature would be a start-up page that’s styled like a magazine and displays a summary of what’s new and important (new e-mails, new feed items, new appointments and so on). Think of a Feedly kind of approach. I love the data that you’re collecting and displaying, but sparklines are “signal to noise”. How about using that row to show the data as different icons (or even textually) and put the folder’s title on or near the folder icon? im using outloook in past few year, but now i use thunderbird, i think its very usefull and simple. Is this something that may make it into 3.0? I love the idea and could make use of the tag visualization right now. David this new theme/layout is awesome! I feel free! 🙂 I used to have type my comments for here in another tab (Text Formatting Toolbar Composer – Fx extension http://codefisher.org/format_toolbar/) because I need to enlarge the text on web pages and the previous comment box didn’t allow me much space at all to see what I had typed and caused me to scroll quite a bit. It’s fresh, clean, bright and wide! From my perspective and use, I think this might be the single most useful element to a start page like this. Especially if it could suggest a filter or two for me. For instance, if I get a lot of regular reporting emails with the same or similar contents, maybe Thunderbird could detect this and suggest a filter for me. This is a great chance to see competing approaches to waht the yahoo beta and gmail labs are testing on their start pages. As of datamining I guess Xobni is a great example of what ca be done. 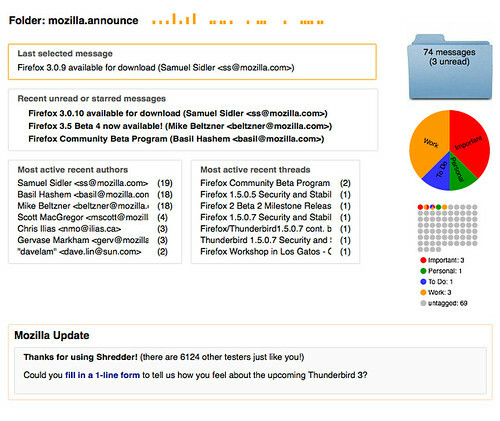 The MozillaMessaging sets the path in a quite clear way too: integration of social interactions and any kind of messaging (twitter, instant, status, etc); and user control over it all, fredom from walled gardens. I must not be the only one who is all over impatient to se the implementation of this to see the light of day.